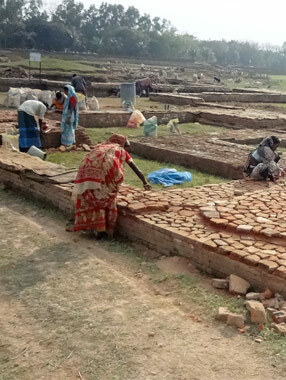 The Project focuses upon development of cultural tourism and site restoration at 4 different archaeological sites in Bangladesh. The sites are Shait Gombuj Mosque, Bagerhat, Mahasthangarh, Paharpur Buddhist Monastery and Kantaji Temple, Dinajpur. The main emphasis of the project is on site restoration and conservation works, civil works and infrastructure development, financial management, tourism promotion and capacity building of the relevant stakeholders in order to ensure the sustainability of the tourism potential within these 4 sites. Two of the sites under the SATIDP (Buddhist Monastery at Paharpur and Mosque City of Bagerhat) are World Heritage Sites, while the Fortified City Mahasthangarh is already in the tentative list of UNESCO awaiting formal nomination by the Government of Bangladesh for inscription on the World Heritage List and Kantaji Hindu Temple Complex is a prime national heritage site carrying significant local and national heritage values. Considering the value assessment of these four sites from both national and international level, civil and conservation works, both have been specified to meet international standards without compromising authenticity. Under this project, we were contracted as the PMDSC unit, and we provided assistance in managing the detailed design, supervision, monitoring of the project including the capacity development activities. Moreover, the main emphasis lies in project management, monitoring, procurement, and financial management, which in turn, will provide support to define detailed program and work plans; procedures for coordination, overall management, and financial management; and project accounting, project performance monitoring system, and reporting; and design, installation and operationalisation of new systems as required. Besides, there exists a specific responsibility to ensure that the works are designed in accordance with international/ national engineering standards, and are constructed to the prescribed quality in accordance with the specifications, bidding documents, and quality assurance systems. The major responsibility involved under the assignment covers Preparation of Master Plan and Management Plan and establishing operating procedures for the site management in the four sites, development of Detailed Design and Preparing Contract Packages and bidding documents for project implementation, Construction Supervision and Contract Monitoring and Supervision during implementation. Development of Tourism Marketing and Development of community based tourism in all the four sites, development of a PMIS system for effective monitoring and evaluation and an overall institutional development. Designed and supervised new display arrangements including installation of interior signage for the site museums at Bagerhat, Mahasthangarh, Paharpur and the proposed interpretation center at Kantaji Temple, Dinajpur.